Hermit crabs are decapod crustaceans of the superfamily Paguroidea. Most of the approximately 1,110 species possess an asymmetrical abdomen that is concealed in a scavenged mollusc shell carried around by the hermit crab. Outside its shell, the soft, curved abdomen of hermit crabs, such as Pagurus bernhardus, is vulnerable. Most species have long, spirally curved abdomens, which are soft, unlike the hard, calcified abdomens seen in related crustaceans. 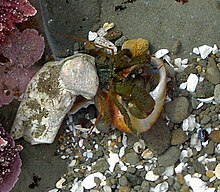 The vulnerable abdomen is protected from predators by a salvaged empty seashell carried by the hermit crab, into which its whole body can retract. Most frequently, hermit crabs use the shells of sea snails (although the shells of bivalves and scaphopods and even hollow pieces of wood and stone are used by some species). The tip of the hermit crab's abdomen is adapted to clasp strongly onto the columella of the snail shell. Most hermit crabs are nocturnal. 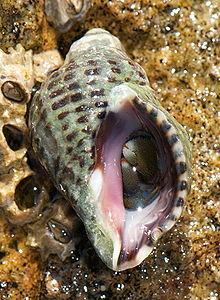 The first group is the marine hermit crabs (with a single species, Clibanarius fonticola, in freshwater). These crabs spend most of their life underwater as aquatic animals, live in varying depths of saltwater from shallow reefs and shorelines to deep sea bottoms and rarely leave for land. As pets, several marine species of hermit crabs are common in the marine aquarium trade. They are commonly kept in reef fish tanks. They breathe through gills but they don't have to carry around their water to do so. Most can survive briefly out of water as long as their gills are damp. However, this ability is not as developed as it is in land hermit crabs. A few species do not use a "mobile home" and inhabit immobile structures left by polychaete worms, vermetid gastropods, corals, and sponges. The second group, the land hermit crabs, spend most of their life on land as terrestrial species in tropical areas, though even they require access to both freshwater and saltwater to keep their gills damp or wet to survive and to reproduce. They belong to the family Coenobitidae. Of the approximately 15 terrestrial species of genus Coenobita in the world, the following are commonly kept as pets: Caribbean hermit crab (Coenobita clypeatus), Australian land hermit crab (Coenobita variabilis), and the Ecuadorian hermit crab (Coenobita compressus). Other species, such as Coenobita brevimanus, Coenobita rugosus, Coenobita perlatus or Coenobita cavipes, are less common but growing in availability and popularity as pets. As hermit crabs grow, they require larger shells. Since suitable intact gastropod shells are sometimes a limited resource, vigorous competition often occurs among hermit crabs for shells. The availability of empty shells at any given place depends on the relative abundance of gastropods and hermit crabs, matched for size. An equally important issue is the population of organisms that prey upon gastropods and leave the shells intact. Hermit crabs kept together may fight or kill a competitor to gain access to the shell they favour. However, if the crabs vary significantly in size, the occurrence of fights over empty shells will decrease or remain nonexistent. Hermit crabs with too-small shells cannot grow as fast as those with well-fitting shells, and are more likely to be eaten if they cannot retract completely into the shell. As the hermit crab grows in size, it must find a larger shell and abandon the previous one. Several hermit crab species, both terrestrial and marine, have been observed forming a vacancy chain to exchange shells. When an individual crab finds a new empty shell it will leave its own shell and inspect the vacant shell for size. If the shell is found to be too large, the crab goes back to its own shell and then waits by the vacant shell for up to 8 hours. As new crabs arrive they also inspect the shell and, if it is too big, wait with the others, forming a group of up to 20 individuals, holding onto each other in a line from the largest to the smallest crab. As soon as a crab arrives that is the right size for the vacant shell and claims it, leaving its old shell vacant, then all the crabs in the queue swiftly exchange shells in sequence, each one moving up to the next size. 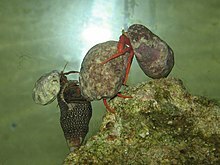 Hermit crabs often "gang up" on one of their species with what they perceive to be a better shell, and pry its shell away from it before competing for it until one takes it over. For some larger marine species, supporting one or more sea anemones on the shell can scare away predators. The sea anemone benefits, because it is in position to consume fragments of the hermit crab's meals. Other very close symbiotic relationships are known from encrusting bryozoans and hermit crabs forming bryoliths. Hermit crab species range in size and shape, from species with a carapace only a few millimetres long to Coenobita brevimanus, which can live 12–70 years and can approach the size of a coconut. The shell-less hermit crab Birgus latro (coconut crab) is the world's largest terrestrial invertebrate. The young develop in stages, with the first two (the nauplius and protozoa) occurring inside the egg. Most hermit crab larvae hatch at the third stage, the zoea. In this larval stage, the crab has several long spines, a long, narrow abdomen, and large fringed antennae. Several zoeal moults are followed by the final larval stage, the megalopa. Hermit crabs are often seen as a "throwaway pet" that would live only a few months, but species such as Coenobita clypeatus have a 23-year lifespan if properly treated, and some have lived longer than 32 years. Hermit crabs are more closely related to squat lobsters and porcelain crabs than they are to true crabs (Brachyura). However, the relationship of king crabs to the rest of Paguroidea is a highly contentious topic. Many studies based on physical characteristics, genetic information, and combined data, support the longstanding hypothesis that the king crabs in the family Lithodidae are derived hermit crabs and should be classified as a family within Paguroidea. Other researchers have challenged this, asserting that the Lithodidae (king crabs) should be placed with the Hapalogastridae in a separate superfamily Lithodoidea. Six families are formally recognized in the superfamily Paguroidea, containing around 1100 species in total in 120 genera. Diogenidae Ortmann, 1892 – 20 genera of "left-handed hermit crabs"
Pylochelidae Bate, 1888 – 9 genera of "symmetrical hermit crabs"
The fossil record of in situ hermit crabs using gastropod shells stretches back to the Late Cretaceous. Before that time, at least some hermit crabs used ammonites' shells instead, as shown by a specimen of Palaeopagurus vandenengeli from the Speeton Clay, Yorkshire, UK from the Lower Cretaceous. ^ a b Patsy McLaughlin & Michael Türkay (2011). Lemaitre R, McLaughlin P (eds.). "Paguroidea". World Paguroidea & Lomisoidea database. World Register of Marine Species. Retrieved November 25, 2011. ^ a b Patsy A. McLaughlin; Tomoyuki Komai; Rafael Lemaitre; Dwi Listyo Rahayu (2010). Martyn E. Y. Low; S. H. Tan (eds.). "Annotated checklist of anomuran decapod crustaceans of the world (exclusive of the Kiwaoidea and families Chirostylidae and Galatheidae of the Galatheoidea) - Chapter: Part I – Lithodoidea, Lomisoidea and Paguroidea" (PDF). Zootaxa. Suppl. 23: 5–107. Archived from the original (PDF) on 2012-01-22. ^ Ray W. Ingle (1997). "Hermit and stone crabs (Paguroidea)". Crayfishes, lobsters, and crabs of Europe: an illustrated guide to common and traded species. Cambridge University Press. pp. 83–98. ISBN 978-0-412-71060-5. ^ a b Jason D. Williams; John J. McDermott (2004). "Hermit crab biocoenoses: a worldwide review of the biodiversity and natural history of hermit crab associates" (PDF). Journal of Experimental Marine Biology and Ecology. 305: 1–128. doi:10.1016/j.jembe.2004.02.020. ^ W. D. Chapple (2002). "Mechanoreceptors innervating soft cuticle in the abdomen of the hermit crab, Pagurus pollicarus". Journal of Comparative Physiology A. 188 (10): 753–766. doi:10.1007/s00359-002-0362-2. PMID 12466951. ^ W. Michael, Scott. "Aquarium Hermit Crabs". Fishchannel.com. ^ Elena Tricarico; Francesca Gherardi (August 2006). "Shell acquisition by hermit crabs: which tactic is more efficient?". Behavioral Ecology and Sociobiology. 60 (4): 492–500. doi:10.1007/s00265-006-0191-3. ^ a b Randi D. Rotjan; Jeffrey R. Chabot; Sara M. Lewis (2010). "Social context of shell acquisition in Coenobita clypeatus hermit crabs". Behavioral Ecology. 21 (3): 639–646. doi:10.1093/beheco/arq027. ISSN 1465-7279. ^ Jennifer E. Angel (2000). "Effects of shell fit on the biology of the hermit crab Pagurus longicarpus (Say)". Journal of Experimental Marine Biology and Ecology. 243 (2): 169–184. doi:10.1016/S0022-0981(99)00119-7. ^ Ferris Jabr (5 June 2012). "On a Tiny Caribbean Island, Hermit Crabs Form Sophisticated Social Networks". Scientific American. Scientific American. Retrieved 6 November 2014. ^ Robert Sanders (October 26, 2012). "Hermit crabs socialize to evict their neighbors". University of California, Berkeley. Retrieved October 27, 2012. ^ A. Klicpera; Paul D. Taylor; H. Westphal (2013). "Bryoliths constructed by bryozoans in symbiotic associations with hermit crabs in a tropical heterozoan carbonate system, Golfe d'Arguin, Mauritania". Marine Biodiversity. 43 (4): 429. doi:10.1007/s12526-013-0173-4. ^ P. Grubb (1971). 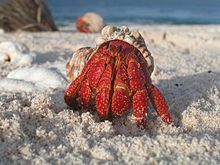 "Ecology of terrestrial decapod crustaceans on Aldabra". Philosophical Transactions of the Royal Society B. 260 (836): 411–416. Bibcode:1971RSPTB.260..411G. doi:10.1098/rstb.1971.0020. ^ H. J. Squires (1996). "Larvae of the hermit crab, Pagurus arcuatus, from the plankton (Crustacea, Decapoda)" (PDF). Journal of Northwest Atlantic Fishery Science. 18: 43–56. doi:10.2960/J.v18.a3. Archived from the original (PDF) on 2011-07-16. ^ Pet Smart Veterinarians (2006). "Land Hermit Crab Care Guide". Pet Smart. Archived from the original on 2011-06-11. ^ Linda Lombardi (July 22, 2008). "Hermit crabs don't have to fade away; with proper care they can have long life". Amherst Daily News. The Associated Press. Retrieved 2017-07-07. ^ Stacy (February 21, 2013). "How old is my hermit crab?". The Crabstreet Journal. Retrieved 2013-04-28. ^ J. D. MacDonald; R. B. Pike; D. I. Williamson (1957). "Larvae of the British Species of Diogenes, Pagurus, Anapagurus,and Lithodes". Proceedings of the Zoological Society of London. 128 (2): 209–257. doi:10.1111/j.1096-3642.1957.tb00265.x. ^ C. W. Cunningham; N. W. Blackstone; L. W. Buss (1992). "Evolution of king crabs from hermit crab ancestors". Nature. 355 (6360): 539–542. Bibcode:1992Natur.355..539C. doi:10.1038/355539a0. PMID 1741031. ^ C. L. Morrison; A. W. Harvey; S. Lavery; K. Tieu; Y. Huang; C. W. Cunningham (2001). "Mitochondrial gene rearrangements confirm the parallel evolution of the crab-like form" (PDF). Proceedings of the Royal Society B: Biological Sciences. 269 (1489): 345–350. doi:10.1098/rspb.2001.1886. PMC 1690904. PMID 11886621. ^ Ling Ming Tsang; Tin-Yam Chan; Shane T. Ahyong; Ka Hou Chu (2011). "Hermit to king, or hermit to all: multiple transitions to crab-like forms from hermit crab ancestors". Systematic Biology. 60 (5): 616–629. doi:10.1093/sysbio/syr063. PMID 21835822. ^ Sammy De Grave; N. Dean Pentcheff; Shane T. Ahyong; et al. (2009). "A classification of living and fossil genera of decapod crustaceans" (PDF). Raffles Bulletin of Zoology. Suppl. 21: 1–109. Archived from the original (PDF) on 2011-06-06. ^ René H. B. Fraaije; Adiël A. Klompmaker; Pedro Artal (2012). "New species, genera and a family of hermit crabs (Crustacea, Anomura, Paguroidea) from a mid-Cretaceous reef of Navarra, northern Spain". Neues Jahrbuch für Geologie und Paläontologie. 263 (1): 85–92. doi:10.1127/0077-7749/2012/0213. ^ René H. Fraaije (January 2003). "The oldest in situ hermit crab from the Lower Cretaceous of Speeton, UK". Palaeontology. 46 (1): 53–57. doi:10.1111/1475-4983.00286.